Cortada Alta is John Peterson's long-awaited vineyard that sits high above the Salinas Valley in the Santa Lucia Highlands. It's the highest elevation site in the entire appellation. Although the vines are young, they show a lot of promise. 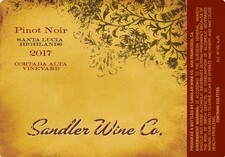 Sandler's first vintage at Cortada Alta, the 2017 will be bottled in late February 2019. Organically farmed by Ruben Balderas, Cortada Alta is planted to 9 different clones of Pinot Noir in many different blocks, all with unique exposures. This is an exciting new project that will produce many memorable wines.